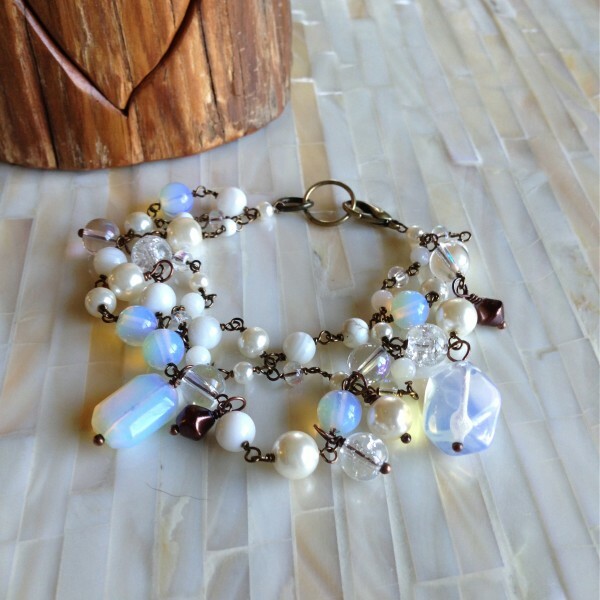 This glowing three-strand bracelet features a whisper of white beads in every shade of white imaginable. A little touch of many different shades come together to create a charming whole effect. The bracelet whispers on your arm as well, sliding comfortably along as you go throughout your day. 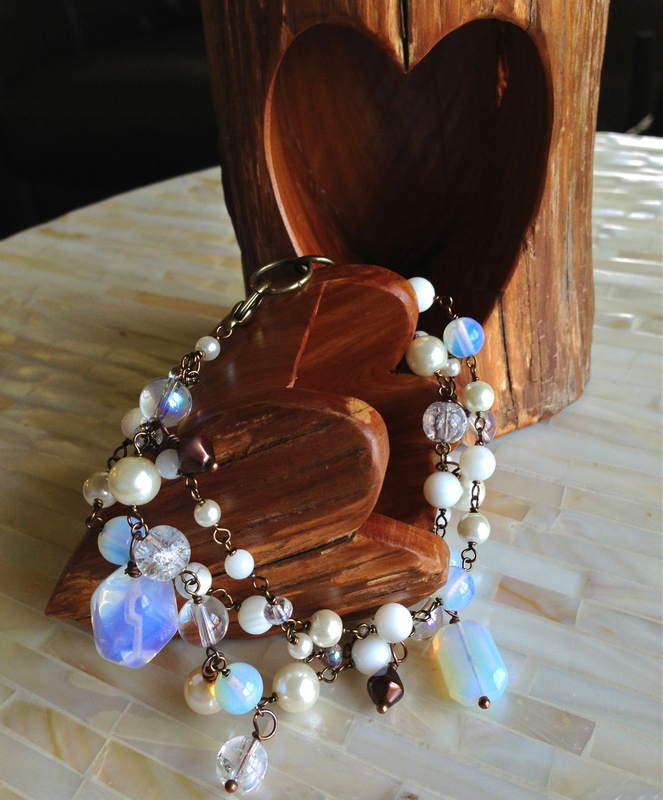 Each link on the bracelet has been wire wrapped by hand with love and care, and the three strands are actually three individual bracelets that come together at the clasp to complement each other perfectly. 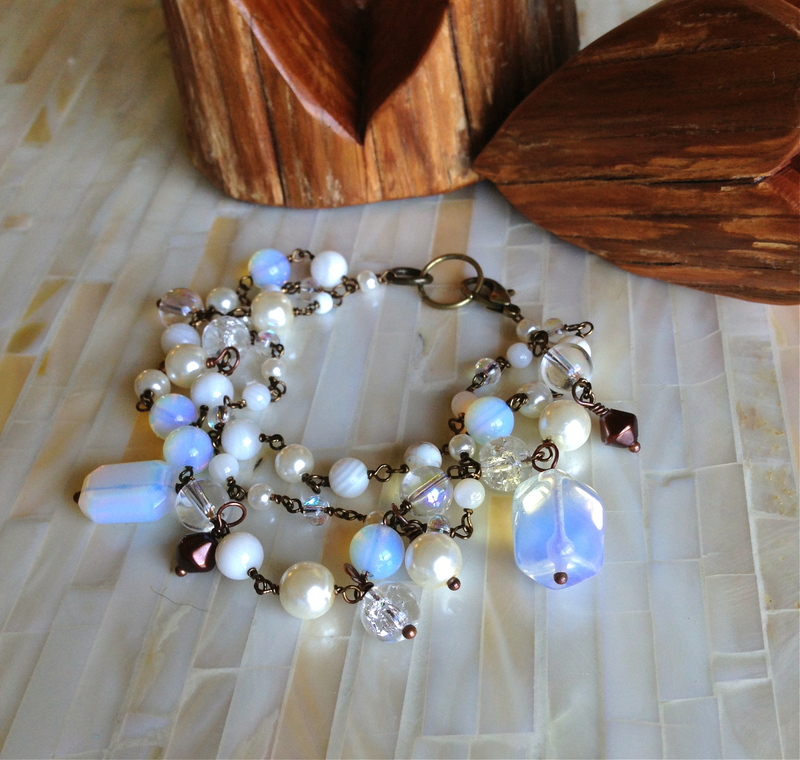 Each bracelet is made with a combination of gorgeous opalite, pearls, gemstones, glass and crystal. All the bracelets were created using the same collection of elements and overall design, but each bracelet follows its own unique freeform pattern that was developed as I was making it, and in that sense, each bracelet is one of a kind. Click on the thumbnails to see larger photos! 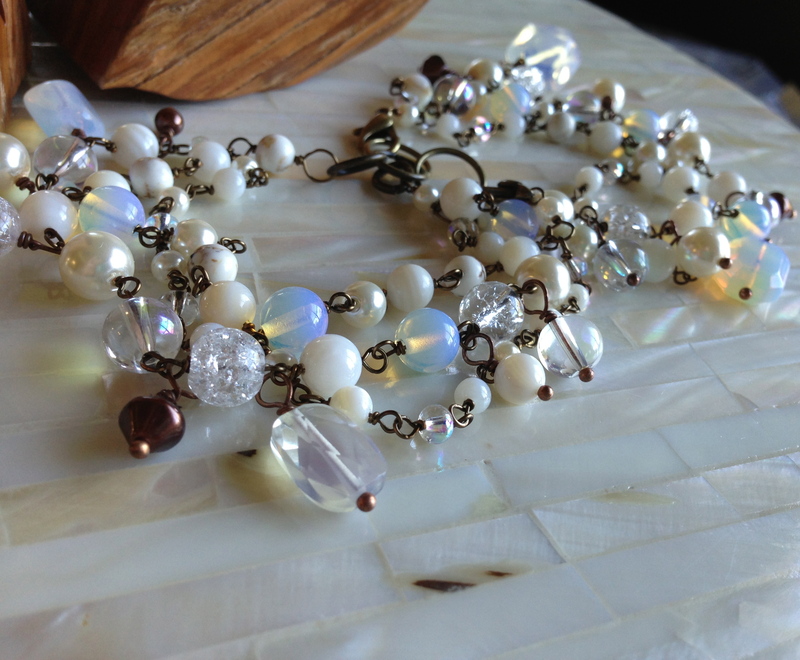 The last photo shows several White Whisper bracelets all stacked together – so lovely in their many shades. Categories: Bracelets, Inspirations Collection. 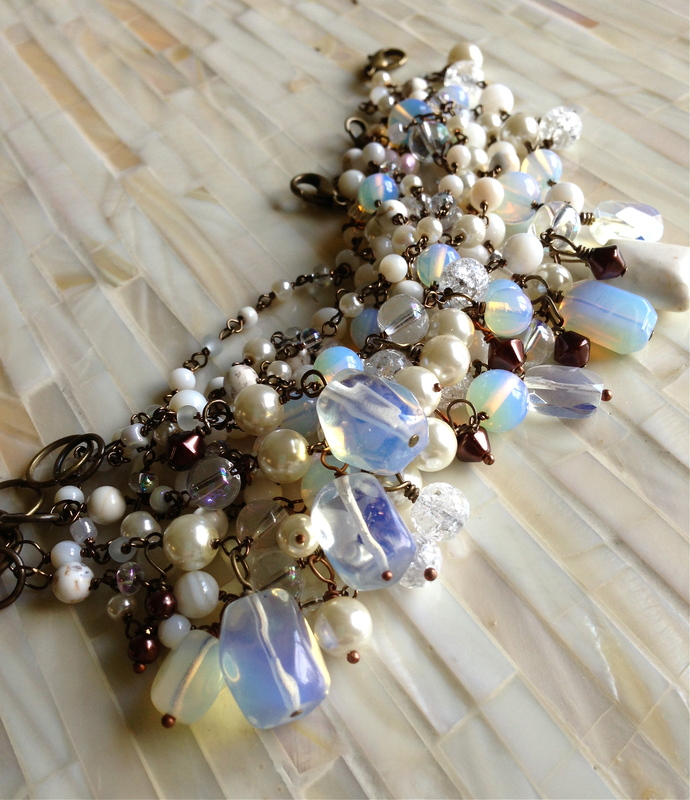 Tags: alice, beaded, brass, crystal, dancer, gemstone, glass, handmade jewelry, pearl. 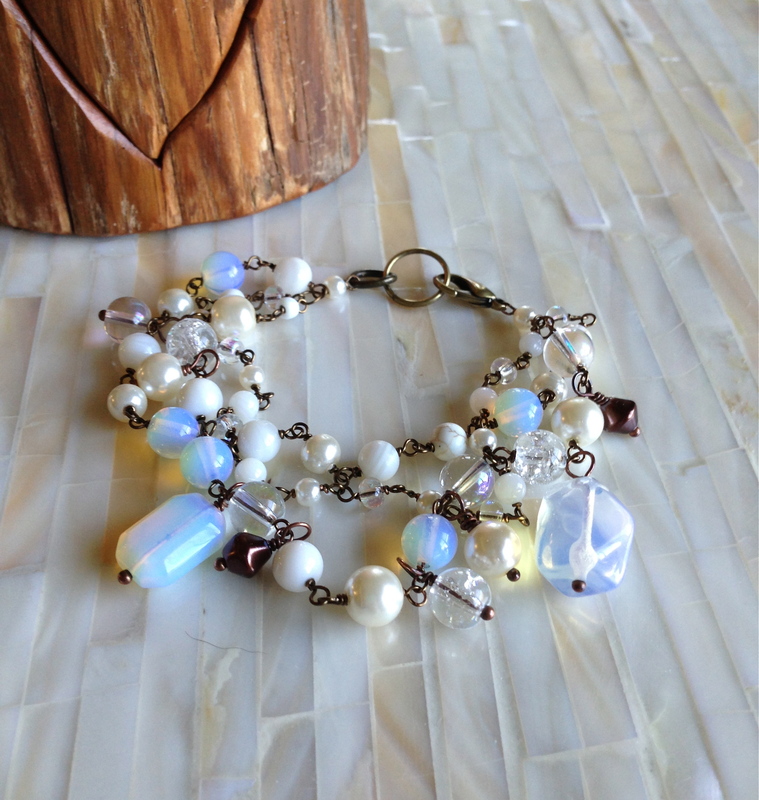 This glowing three-strand bracelet features a whisper of white beads in every shade of white imaginable. A little touch of many shades come together to create a charming whole effect. The bracelet whispers on your arm as well, sliding comfortably along as you go throughout your day. 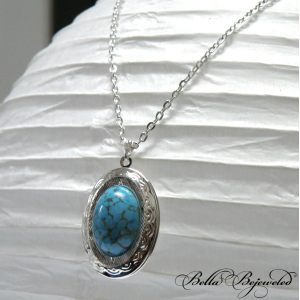 The bracelet closes with a lobster clasp, and has a couple adjustable links at the end to find your perfect fit. We currently have three sizes available – XS/S (6-7.5 inches), M (7.5-8.5 inches ), and L (8-9 inches). 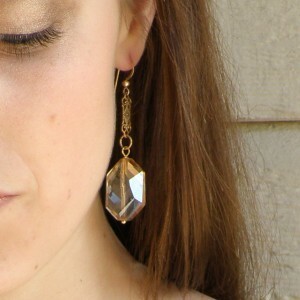 Please specify which size you’d like in the “notes to seller” at checkout; if no size is requested, we’ll send you a M.